While the deep-sea may be the final frontier for marine biologists, caves remain one of the most elusive frontiers on (or rather, under) the land. Some caves extend dozens of miles below the ground in endless, sinuous networks all but cut off from the grassy hills and tree-lined horizons above. It’s not an easy environment to access and many explorers have perished attempting to map these subterranean labyrinths. Yet, for the last couple decades in particular, investigations keep finding astonishing communities of invertebrates inhabiting caves and existing nowhere else. 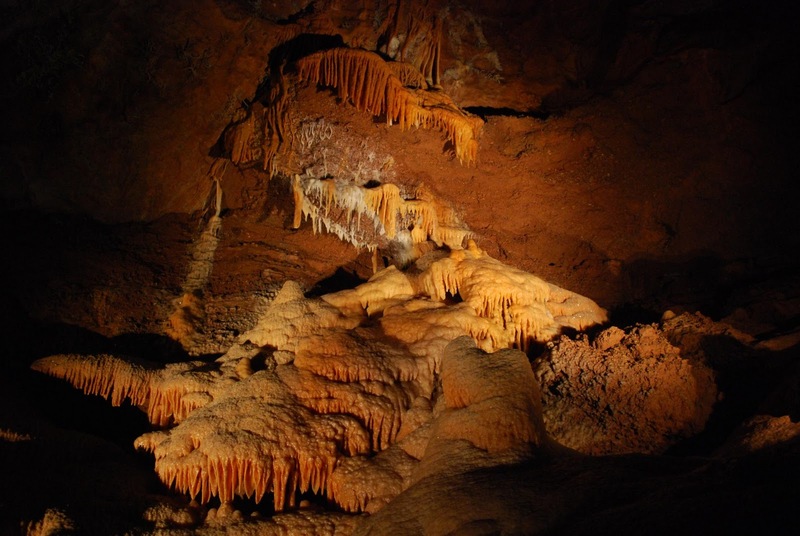 Nestled in Australia’s stunning Blue Mountain range is the 350 million year old Jenolan Caves Karst Conservation Reserve. Here, the base of the invertebrate community consists of decaying leaf litter. Historically, eucalyptus trees, which are native to the area, contributed most to the leaf litter pool. Over the years, introduced trees – like European sycamore brought in to stabilize steep, rocky slopes and North American Monterey pine planted for the timber industry – have naturalized around the cave opening. 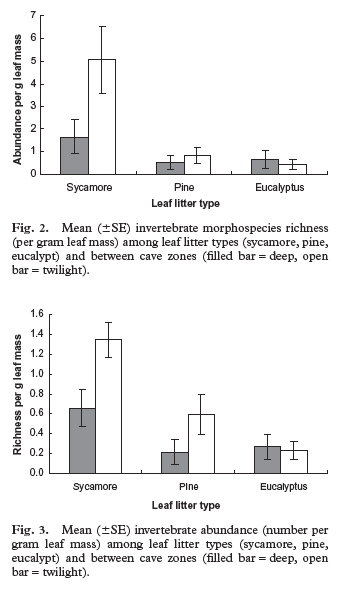 To understand what effects the differences in leaf little composition have on cave communities, Hills and colleagues measured the rate of leaf litter decay and invertebrate diversity among the 3 leaf litter pools in “twilight” areas (i.e. nearer to cave openings) and “deep” areas (i.e. where the cave is always dark). The most rapidly decayed leaves were of the introduced Sycamore, which suggests their leaves release more carbon and nutrients into the cave ecosystem. Additionally, there was no difference in leaf decay rate between “twilight” and “deep” leaf litter, so it appears it doesn’t matter how close the litter is to above-ground features like light, rain and wind. It is not difficult to imagine how generations of organisms become better adapted to consuming the food that is available to it if that food source doesn’t change over time. More efficient break-down of the plant matter, resistance to bitter tannins, adjusting body size and metabolism to food availability - all strategies to adapt to food supply. Fast forward to our current century and globalism has rapidly introduced new organisms to every corner of the planet at an unprecedented pace. Are the invertebrate communities more diverse and abundant on the native vegetation that it may be better adapted towards? The abundance and species diversity are much greater for the introduced european Sycamore than either the pine or Eucalyptus (see graphs below), especially in the “twilight” zone. This may be because sycamore leaves have higher specific leaf area (SLA) than both pine and eucalyptus. A low SLA is associated with long-lived leaves containing many structural and defensive compounds. These trees, like pines and eucalyptus, invest heavily to guard against plant-eaters whereas the broad-leafed sycamore does not invest as heavily against herbivory, so leaves break down more quickly. This faster release of nutrient may be part of the reason sycamore leaves have a more abundant and diverse community. Paradoxically, in an environment shaped by constancy over time and space, nutrient pulses may reduce diversity over time. If this is only a seasonal phenomenon, complete species replacement would be unlikely given that established invertebrates may utilize multiple plant sources over the year and persist over the long-term. There will always be a staple of of the community that are more generalist and can inhabit the caves under strenuous circumstances. But, in sort of a temporal intermediate disturbance hypothesis sort of way, one can envision the rapid change disrupting the system as a whole and having cascading effects throughout the cave ecosystem. Regardless, the moral remains: indifference towards species natural adaptions results in far-reaching and unforeseeable shifts to their ecology and evolution.